In the early versions of ‘The Spellbound Spindle’, I’d experimented with having the male characters in full armour. But that didn’t last as it didn’t suit the narrative to have extra people nearby during the fight scenes, like squires to help with the armour and weapons. Instead, I chose for the ‘armour’ to be no more than a padded defensive jacket, called a gambeson, which was usually made of linen or wool. I didn’t view any of the research as wasted though because I learned a lot, like the terms for the different sections of armour; the whole ‘outfit’ was a lot more complicated than I’d realised. When armour was first introduced, it was easy to get into as it basically consisted of mail, which was pulled over the head, over which was buckled a coat of plates. The fastenings were either at the back or on the sides and shoulders. As armour evolved to afford as much protection as possible to the wearer, it became more complicated. Despite its cumbersome appearance, plate armour didn’t take that long to put on and remove. So long as a knight had the help of his squire, he could have the suit of armour on in a matter of minutes, and off again as quickly. First, the knight would put on an arming doublet, which was very like a gambeson. 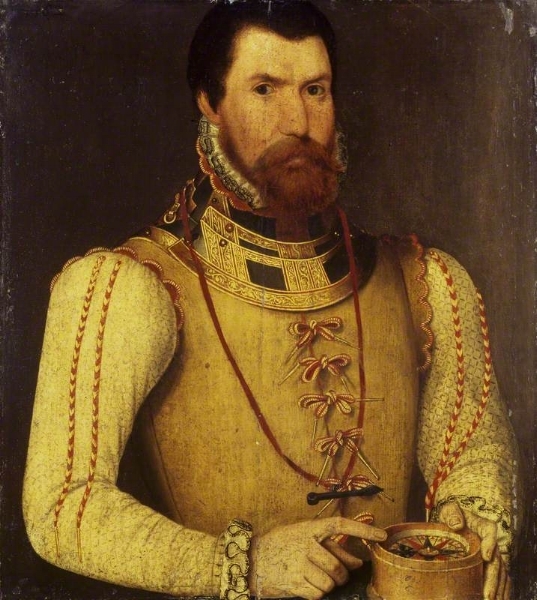 In the 15th and 16th centuries, arming doublets were made with arming points. These were reinforced parts on the doublet for lacing pieces of armour. After that, a knight was always armed, starting from the feet, moving upwards to finish with the helmet. Having said that, the images I found with reference points all start at the top and work down. So, to keep things straightforward, I shall start at the top, with the helmet. A – Helmet, which was lined inside, not only for comfort, but also to cushion blows. B – ‘Gorget’, a piece of armour to protect the throat. C – the self-explanatory Shoulder Piece. D – Palette, which protected the armpit. E and F – Breastplate. G – ‘Tasses’, a series of overlapping metal plates that form a short skirt over the body below the waist. H – ‘Vambrace’, forearm guards. I – ‘Brassard’, armour for protecting the upper arm. J – Gauntlet, which was usually fitted with a leather glove inside to allow the knight to grip his weapons. K – ‘Cuisse’, a piece of plate armour covering the thigh. L – ‘Jambeau’, the armour that covered the leg below the knee. N – ‘Solleret’, a flexible steel shoe, over which spurs were usually buckled. It doesn’t show it in the image, but the sword would have been attached to the armour with a belt, which would have had straps at the front and the back to hold the scabbard at a convenient angle. And that wraps up the research I did for this novel. I hope you enjoyed the brief foray into medieval times. More people made up a castle household than I realised. At the top were the lord and lady (or the king and queen, depending on the castle in question), the nobility – barons, earls and dukes, and the noblewomen who became their wives. There weren’t many choices in life for noblewomen. The obvious one was to get married; or they could seek service with a wealthier noblewoman; or they could join a convent and become a nun. Those who were rich had no shortage of suitors because, once married, the woman’s inheritance would pass to the husband. The lady of the castle was usually well-educated with the ability to read and write, and was most likely able to speak foreign languages as well as understand Latin. Her responsibilities were many, including being in charge of the domestic running of the castle, overseeing areas like the kitchens and living quarters. As she was in charge of the household, she had to check the accounts and agree to any expenses. She also arranged the accommodation of guests. Although her main role was to provide heirs, she was her husband’s equal in her day-to-day support of him, and, when he was away, the entire responsibility of the castle was given to her. There have been examples of women, in their husband’s absence, defending the castle and holding it against the enemy. An inspiring example (sort of local, for me) is Lady Mary Bankes, the wife of Sir John Bankes, Chief Justice of the Common Pleas. After England’s Civil War broke out in 1642, Charles I ordered John Bankes to serve in London and Oxford. Corfe Castle by then had become the last Royalist garrison on the Dorset coast, and Lady Mary remained at the castle with her children, servants and a force of five men. In May 1643, a force of about forty Parliamentarians demanded the surrender of the castle’s ordnance. Lady Mary’s answer came in the form of cannon fire, which drove them away. Later however, to buy time to resupply the castle, she gave up the ordnance. A month later, the castle was under siege by a force of about 500-600 men. Lobbing stones and hot embers from the battlements, Lady Mary and her tiny force managed to repel the enemy, killing and wounding over 100 men. Three years later, in 1646, she was betrayed by one of her own officers, who led a party of Parliamentarians into the castle. With their jackets reversed, they were mistaken for Royalists, and ‘Brave Dame Mary’ had no choice but to surrender the castle. But her courage was acknowledged, and she was allowed to keep the keys to the castle, which can still be seen at Kingston Lacy, a manor house built by her eldest son, Sir Ralph Bankes. The Steward was the most senior servant, in charge of the rest of the servants. The Marshal, sometimes called the Marshalsea, was in charge of the castle in the absence of the lord and lady. As warden of the castle, it was his job to see to the training of the guards, knights and squires. He was also responsible for discipline. The Reeve saw to the farms and common land belonging to the castle. It was he who collected the rent and taxes. Knights or men-at-arms lived in the castle grounds, and their duties included protecting the castle and the lord’s lands. A large portion of their day was taken up with patrolling the surrounding area. They also had to practice their weapon skills daily. Squires were knights-in-training. Apart from book-learning, they had to study archery, sword-fighting and equestrian skills. Pages not only performed mundane duties such as running errands, delivering messages and serving, they also cleaned weapons and learned the basics of combat. As mentioned in last week’s post, there was also the kitchen staff, from the butler and pantler to the milkmaid and scullions. Last, but definitely not least, were the peasants. They usually lived and worked on the lord’s estates, farming his land, sometimes paying for the privilege of baking their bread in his oven. It was, undoubtedly, a hard life, the irony being the lord’s lands would yield no produce and income without these lowly workers. 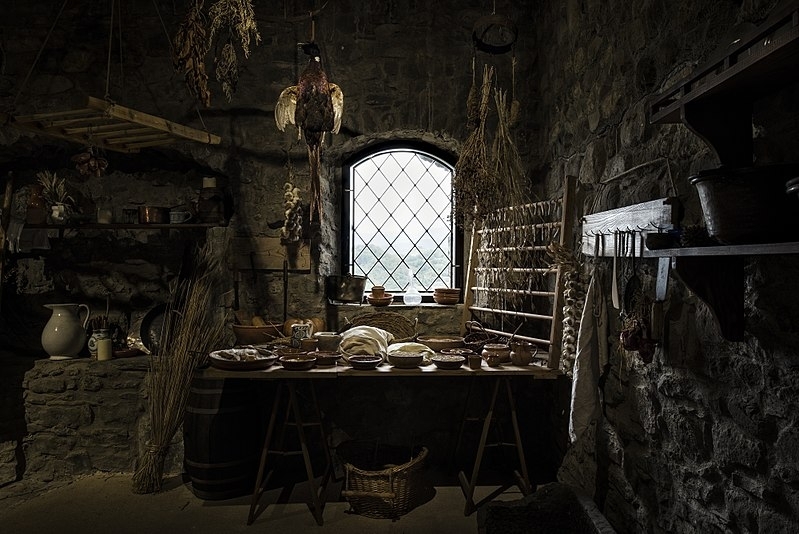 One of the most important places in the medieval household was the kitchen with its task of storing and preparing food, and the responsibility of feeding the entire household. Kitchen staff in castles were numerous, from bakers, butchers, page boys, milkmaids and scullions. Other key positions included pantler (in charge of the pantry), butler (in charge of the buttery) and the poulterer (in charge of poultry). Three offices that worked closely with the kitchen were the Napery, which was responsible for the washing and storage of linen, including table linen; the Laundry, responsible for washing and storage of clothes; and the Ewery, which was responsible for water and the vessels for drinking and/or washing of the person. (An ‘ewer’ is a type of pitcher). Cooking utensils included frying pans, pots and kettles. The tools used were specific to cooking over an open fire and to skewer anything from small quails to whole oxen. Other utensils included knives of all sizes, stirrings spoons, ladles and graters. As ovens were expensive to build, only castles and bakeries had them. So, for everyone else, cooking was done on open fires. Stew pots were the most common cooking implement as it made the most efficient use of firewood by not wasting precious cooking juices. One of the most interesting things I came across was the importance that was placed on ensuring the food was prepared in a way that complemented contemporary standards of medicine. As fish was considered cold and moist, it was to be cooked in a way that heated and dried it, such as frying or oven baking, and it had to be seasoned with hot and dry spices. Beef, on the other hand, had to be boiled as it was said to be dry and hot. But as pork was hot and moist, it was best roasted. Although wild game was popular, most meat came from domesticated animals. Unlike today, beef was not a common dish. Raising cattle required a lot of labour, pasture and feed. Cows and oxen had more value as draught animals and for producing milk. The more common meat was pork as domestic pigs didn’t need much attention, tended to run free, and could be fed on any, if not all, kitchen waste. In areas with a sizable wool industry, mutton and lamb were also common. No part of the animal was wasted; even the ears, snout and tail were eaten. And the intestines and stomach were used as casings for sausages. The fowl equivalent of the pig was the chicken, and was the most popular bird on the menu, followed by geese and ducks. Other birds that were eaten included quail, partridge, cranes and even songbirds like larks and linnets. Only the upper classes ate swans, although they were admired more for their appearance than their meat. There was a wide variety of fish available, including herring, salmon, eel, plaice, cod, whiting, trout and pike; also, shellfish, like crab, oysters and mussels. A bread-based diet only became more popular during the 15th century. Wheat was considered the most nutritious of all grains and was common all over Europe, but as it was more expensive, it wasn’t available to all. The most common grains were rye, barley, buckwheat, millet and oats. Grain, in the form of bread crumbs or flour, was commonly used to thicken soups and stews, either alone or combined with almond milk. As fine-textured food was associated with wealth, only the upper classes could afford finely milled white flour for their bread. The bread of the lower classes, on the other hand, was coarse and dark. The most common loaf shape was round. One of the most familiar components of a medieval meal were sops. These were pieces of bread which were used to soak up liquids like soup, broth and even wine, and eaten. Grains were also used to make porridge, which was served as desserts or boiled in milk as a hearty dish for the sick. Another common dish was frumenty, which was a thick porridge made of wheat, boiled in meat broth and seasoned with spices. Pies were not always edible. Before the 15th century, pastry was solely used as a cooking container for the pie’s ingredients. ‘Huff paste’ was a technique which used a mixture of flour, suet and boiling water to make a stiff pie shell or coffyn. When cooked, the pastry would harden to protect the food inside. Considered inedible, the pastry was usually discarded, although sometimes the servants would eat it as it would be soaked with the meat juices. In the late 14th century, things like shortcrust pie and the clarification of jelly with egg whites began to appear in recipes, signalling significant developments in the cooking and eating habits of the day. Pies filled with meats, egg, vegetables or fruit became common, along with pastries like turnovers and fritters. Fruit, served fresh, dried or preserved, was popular in the medieval diet. It was common in many cooked dishes and was usually combined with meat, fish and eggs. Fruit was used to sweeten dishes instead of sugar, which was expensive. The south had lemons, citrons, bitter oranges, grapes and pomegranates, while apples, pears, plums and strawberries were more readily found in the north. Vegetables that are everywhere now, like potatoes and tomatoes, weren’t available until the 15th century and even then, they weren’t readily accepted. More common were carrots, onions, beets, cabbage and garlic, and legumes. I mistakenly assumed that milk was widely consumed. Although it was an important source of protein for those too poor to afford meat, adults rarely drank plain fresh milk. It was drunk mainly by the poor or sick, and usually kept for the very young or the elderly. Another thing I didn’t appreciate – almond milk was used in medieval times, because there was no way to keep fresh milk from spoiling. Cheese was important, especially for the common people, and included varieties we’re familiar with, like Dutch Edam and Italian parmesan. The most familiar herbs were sage, mustard and parsley, caraway, mint, dill and fennel. Mustard was also popular, and anise was used in fish and chicken dishes. Almonds were more common than I realised. They were used whole, shelled or unshelled, ground and processed into almond milk. Almond milk was regularly used as its mild taste and creamy texture mixed well with spices and sour liquids. The most essential ingredient in medieval cooking was salt. The most common form of food preservation was salting and drying. Elaborate meals always had a container of salt on the table. The degree of grandeur of the salt container and the quality of the salt were used to signify the host’s wealth, and to acknowledge the importance of the guest. Saving the best, in my opinion, for last – sweets and desserts, collectively known as puddings. The term ‘dessert’ is taken from the Old French, ‘desservir’, which originated during the Middle Ages and literally means, ‘to un-serve’ or to clear a table. Served along with mulled wine and aged cheese was a bite-sized form of confectionary encased in a hard, outer shell called dragées. By the Late Middle Ages, fresh fruit covered in sugar, honey or syrup would also be served. Puddings would come to include fritters, crepes with sugar, sweet custards and darioles. Dariole was a French term for a small, flowerpot-shaped mould used to cook and serve an individual sweet or savoury dish. Recipes for sweet and savoury custards, sauces and tarts with strawberries, plums, apples and cherries have been found in Anglo-Norman cookbooks. English chefs were known for using flower petals, like roses, violets and elderflowers, as decoration. The dessert of choice in northern France seemed to have been waffles and wafers eaten with cheese, and enjoyed with hypocras (or hippocras), a wine-based drink mixed with sugar and spices, and sometimes heated. ‘Épices de chamber’ or ‘parlour spices’ – candied ginger, coriander, aniseed and other spices – were taken at the end of a meal to help with digestion and was meant to ‘close’ the stomach. And, with that, I shall close this post. Though I now have a yearning for apple pie and custard! Suffice to say, I’ve never lived in a castle. As a lot of ‘The Spellbound Spindle’ is set in castles, cue research for the set-up of a medieval castle. The castle’s sole purpose wasn’t simply to house soldiers. More importantly, it was home to the king or the knight and his household. Apart from the family, the household comprised everyone who kept the castle running, from the steward and ladies-in-waiting, all the way down to the kitchen staff. I’ll talk about the people in the castle in another post. The rooms in a castle were very similar to rooms that are found in modern houses, with similar names. For example, kitchens were called kitchens as were pantries and cellars. The most important room in a royal palace or castle was the Great Hall. Unless there was another hall, it was usually referred to simply as ‘the hall’. Rectangular in shape, it normally had windows on one of the long sides. Opposite the entrance was the dais with the top table. 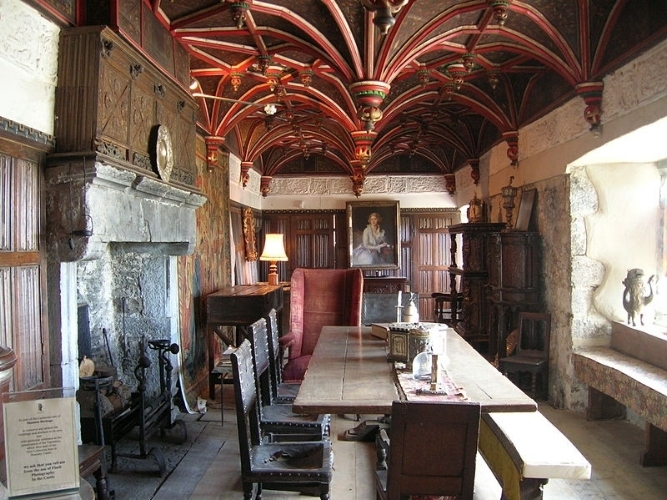 The hall not only served as the place for the household to dine together, it was also used for receiving guests. It was not uncommon for some of the household to sleep on the floor. Castles were not known for their warmth. One of the reasons tapestries were so popular was their ability to block the damp and draughts. Even during warm weather, castles remained cool with a touch of damp, which led to the inhabitants spending a lot of time outdoors. To keep warm while inside, many would wrap themselves in blankets. Nobility also had the luxury of feather mattresses and fur covers. Bed chambers or bedrooms were usually called the Lords and Ladies Chamber or the Great Chamber. To begin with, it was a partitioned room at the end of the Great Hall before it was moved to an upper floor. Here, the noble family could retreat for some privacy. Their personal attendants stayed close, in separate sleeping quarters. Great Chamber - ‘Salon in Makartstil’ by Georg Janny (wikipedia) - ‘Makartstil’ referred to Janny’s aesthetic of painting in brilliant colours and fluid forms. The Great Chamber was also called the Solar. Intended for sleeping, it came to be used more as a private sitting room. Smaller than the Great Hall, it afforded comfort, somewhere the family could take refuge from the constant activity, noise and smells of the Great Hall. The solar was used mainly for solitary activities like reading, embroidery and writing, the sort of activities that required good light. So, most solars were built facing south to make the most use of the daylight. Smaller rooms, apart from offering more privacy from servants and other family members, were also more comfortable and easier to heat. As it was for the use of one person, there would be a separate room for the lord and another one for the lady. The lord’s private room was called the cabinet, or the closet, study (from the Italian ‘studiolo’, meaning ‘little studio’) or office. Placed just by his bedchamber, it was usually furnished with books and art. Kings would also use their cabinets for small private meetings with their ministers. Interesting side note – the term ‘Cabinet’ used to describe the principal executive group of the British government was derived from this room. The boudoir was the lady’s private sitting room or dressing room, or her private bedroom. The term derives from the French, ‘bouder’, meaning ‘to pout’. Apparently, the room’s original use was a space for sulking in! Coined by a man, methinks? Like the man’s cabinet, the lady’s boudoir was located next to her bedchamber. Here, she would bathe and dress. Bathrooms and toilets, or latrines, were basic. Baths were taken in wooden tubs that could be moved around. It wasn’t unheard of for baths to be taken outside in the summer where the water and the bather would be warmed by the sun. Obviously, there would be a tent or canopy around the bather to ensure privacy. In medieval times, toilets were called ‘garderobes’. Derived from the French word for ‘wardrobe’, garderobe originally referred to “a small room or large cupboard, usually adjoining the chamber or solar and providing safe-keeping for valuable clothes and other possessions of price: cloth, jewels, spices, plate and money” (Frank Bottomley, medieval architecture scholar). Because medieval toilets were usually located inside a small chamber, ‘garderobe’ came to be used to describe them too. A garderobe was no more than a hole discharging to the outside into, either, a cesspit or the moat, depending on the structure of the building. And so, down we go to the kitchens. In the Middle Ages, to make the most efficient use of the heat, most of the cooking was done on an open hearth in the middle of the main living area. It was in the Late Middle Ages that separate kitchen areas began to evolve. In wealthy homes, kitchens were usually located on the first floor. But in castles and monasteries, the kitchens were either moved to a separate building or kept separate from the Great Hall because of the smoke from the kitchen fires and, also, to minimise the damaging effects in case of fire. There were different rooms for different types of food storage and preparation. The pantry served in a secondary capacity to the kitchen and was where food, originally mainly bread, was stored and prepared. The word pantry is from the same source as the Old French term, ‘paneterie’, from ‘pain’, the French form of the Latin ‘pan’ for bread. The larder was used mainly for storing meat and had to be as cool as possible and close to the food preparation areas. It also had to be constructed in a way to keep out flies and vermin. There were usually hooks on the ceiling to hang joints of meat or game. In the northern hemisphere, larders and kitchens usually faced north or were on the east, least sunny, side of the property. The buttery had nothing to do with butter. Instead it was where wine, ale and beer were stored; the room takes its name from the beer butts (barrels). The buttery was located close to the Great Hall and usually had a staircase to the beer cellar below. Outside the castle, continuing with the theme of food storage, one might find the ice house. This was the equivalent of our fridge. The ice house was, as the name suggests, an insulated house to store ice. During the winter, ice and snow would be taken into the ice house and packed with insulation in the form of straw or sawdust. This would allow it to remain frozen for many months. The ice was mainly used for the storage of perishable foods but could also be used to cool drinks and for the preparation of sorbet desserts. Ice houses were usually man-made underground chambers, built close to natural sources of winter ice, like lakes, with a drain to allow any water to flow out. Finally, at the outer entrance of the castle could be found the gatehouse and guardrooms. The gatehouse was a fortified structure built over the gateway. It would include a drawbridge, portcullises, machicolations, and possibly murder holes. Defenders could either throw rocks and fire arrows through murder holes or pour boiling water or oil onto the attackers. I haven’t covered all the rooms and areas of a castle, but these are the one I found most useful for giving me the background knowledge to, I hope, make the castles in ‘The Spellbound Spindle’ more realistic.